So when we really talk about how the Metroid series is the true start of the Metroidvania genre, the game most people immediately think about is Super Metroid. This the title that took what people expected from the series, perfected it, and added in everything gamers didn't even know they wanted. This game, for many, many games is the epitome of Metroidvania, through and through. To start with, the game is a beauty to behold. If you like your adventure games full of dark, dank, oppresive sci-fi aesthetic, Super Metroid has it in spades. Despite being an early title on the SNES, the third game in the series featured visuals that held up not only to the end of the Super Nintendo's lifespan, but still hold up today. 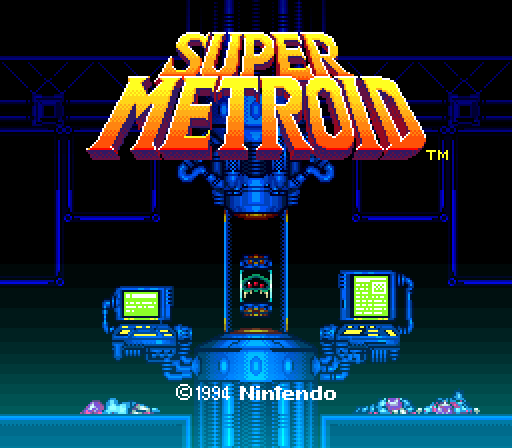 When Nintendo comes along with a new game in the series, it's always compared to Super Metroid, and the further the games veer from the visual style of this title, the more gamers balk. Visuals aren't enough, of course. With Super Metroid, Nintendo improved the gameplay of the series as well. As Metroid II: Return of Samus achieved before, Nintendo was able to show that Samus could have new powers and new abilities (tucked away in some of the most obnoxious to find places), and instead of dilluting the gameplay, they'd enhance it. So while this game ditched the wall-crawling Spider Ball from the second game, it did add in more power-ups than you could shake a stick at, improving the overall experience. Speed Booster, Grapple Beam, X-Ray Scope, Super Missiles, Power Bombs -- these powerups don't just act as gateways but also give you more options for how you explore, never holding your hand but simply giving you a hint about what you can do. Arguably, more than even the previous two games in the series, Super Metroid allowed for truly non-linear exploration. Just watch any speedrun of the game to see all the multitude of ways to navigate the game, with so many ways to try and beat the game. In fact, arguably the only essential powerups are the Morph Ball and a few Missiles/Super Missiles. Once you've collected those, where you go and what you do are entirely open to you, all without having to perform game-breaking glitches to do it. The Zebes of the game is a wide-open maze, a dream for any Metroid fan to play through. Of course, so much of the game sets the stage for what the Metroidvania genre as a whole. In many ways, it feels like Castlevania: Symphony of the Night, arguably still the pinnacle of the Castlevania side of Metroidvania, was a direct response to this game, a statement that "we can do everything you did, and here's how." Super Metroid has dozens of powerups, many of them options, and different ways to explore its planet, and so does Symphony's castle. Sure, you don't need the Speed Booster, or Form of Wolf, the Varia Suit, or Echo of Bat, not if you're good and know what you're doing, but the powerups are there for your explorational amusement. Need a map to explore your world? Both games provide them, as well as save points along the way to secure your progress and restore your health. Although a good player can get through either game without ever once looking at the map or using a save point, the rest of us peasants loved their inclusion in Super Metroid. By the time Symphony of the Night came along, they already were so essential to the makeup of Metroidvania that we didn't even think twice about the game having maps and save points. Of course a game in the genre would have them. it was just natural. And that doesn't even get to the little details that Symphony cribbed from Super Metroid. Ever wonder why Alucard has a blue glow that follows along behind him when he moves. Sure, it seems cool and vampiric, but Samus had it first, anytime she turned on her Speed Booster. And while Symphony did add an RPG progression system to the mix (replacing the need for Samus's limited armor selection with a plethora of items, weapons, and armors to choose from), you can still find shades of Samus's Energy Tanks in the Health Ups and Heart Increases Alucard could find. In short, every Metroidvania game since Super Metroid owes a debt to what this game did. The genre would look very different if the third Metroid had changed anything about it mix. But then, if the game had been different, it might not have been the cornerstone an entire genre was built on. After Super Metroid, the series went in a few different directions. It would take eight years for Nintendo to release follow-ups, but in 2002 we were graced with two different ones. Metroid Fusion was a side-scrolling game and direct sequel to Super Metroid. We will focus on that game next in our look at games related to Castlevania as it was very obviously released in answer to what the Castlevania series was doing with the genre. Meanwhile, Metroid Prime acted as a prequel to most of the series (taking place after the first Metroid but before all the rest). It was also a 3D exploration game, one that showed the Metroidvania formula could be adapted outside the cozy confines of 2D. It's very good and launched is own Prime sub-series. We're not going to discuss that game in detial on this site, though, as the Castlevania series never seemed interested in emulating Prime or its follow-ups. Later one, Nintendo would release two remakes of the original Metroid games (which we cover on this site), as well as Metroid Prime Pinball, Hunters, Federation Force, and Other M, none of which resemble anything Castlevania has done (unless you want to somehow draw a connection between pinball and pachinko, which we don't) so there's little need for us to go into them in detail.